If you don’t know where you want to go, you shouldn’t have any trouble getting there. A “divergence” from my original travels plans illustrates this point and led to one of my most colorful experiences during my time in Colombia. 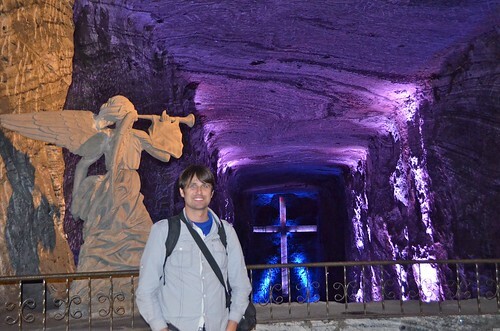 While the “Salt Cathedral” had vaguely been on my list of places to visit during my time in Bogota, I hadn’t given it much importance. Frankly, it sounded like a touvrist trap. I’m not that into visiting churches either. But after hearing it mentioned a few times, it eventually landed on bottom of my list of places I’d hope to perhaps visit while in Colombia’s capital. The most concrete my intention got was the rough idea that I’d try to visit it on my return from Villa de Leyva. On August 28, 2013, it was time for me to get out of Bogota for a few days. Time to tone down my socializing, do a bit of real work and, of course, relax somewhere new. 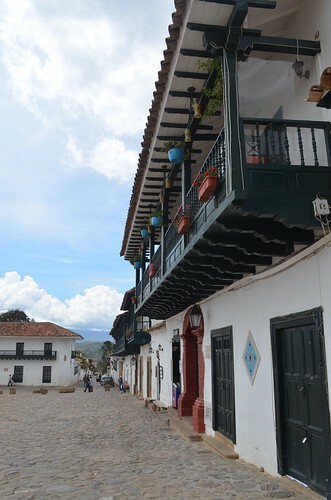 I wanted to head to Villa de Leyva, a colonial town north of Bogota. (I’d eventually get there but that day it was to be.) It’s a pretty well-known spot that has largely preserved its original look and feel. Like most of my travels around the world, I figured I’d just wing it by first going to the bus station. I’d find a bus or taxi or something to get there. In spite of some warnings by my hotel’s staff that it wasn’t going to be possible due to a national strike and even a local “driver” tried his best to convince me to let him drive me there, I set out alone. I arrived at the main bus station and headed to the various companies asking about buses to Villa de Leyva. The bus station was pretty empty, especially the part selling tickets northwards. After asking at the “sparkly,” tourist welcome center, I knew that my best intentions were probably not going to get me to Villa de Leyva considering that there weren’t any buses. After wondering around, I ended up at one of the “information” counters talking to a man about my options and about where I had wanted to head. The man eventually got a phone call and, too impatient to wait, I headed out to see what the taxi drivers could offer me. A few minutes later, the information desk man ran after me and told me two people were going to the Salt Cathedral that day. My main desire was to get out of town, so without any set destination, anywhere was good enough. I also reasoned that I might as well head north to see if I could head a bit farther north afterwards to Villa de Levya. That’s where I met my two travel companions: a local Colombian girl and her friend from Ecuador. They were equipped for a day-trip while I had my baggage for a few day stay in Villa de Leyva. We discussed about the travel troubles and settled-in together on the bus toward the Salt Cathedral. We chat about nothing in particular in Spanish. After a bus and a taxi ride, we were at the Salt Cathedral. In reality, it was a pretty interesting site. 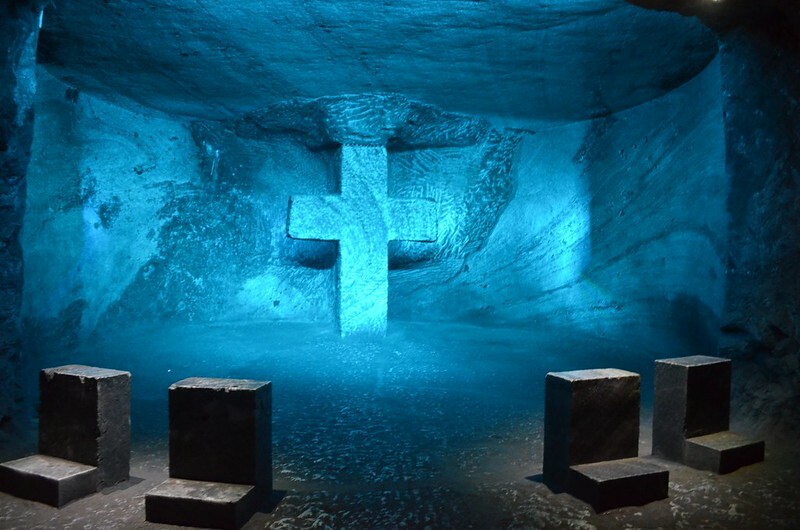 It had been converted from its previous usage as a salt mine. They had added “disco”-type lighting, which created a pretty unique effect on the various religious, carved-out enclaves. The three of us were in a pretty playful mood and the visit went quite well as our guide led us through the mine, explaining the different features. We ended our visit with a “terrible,” 3D movie about the origins of the mine and wondered back towards the entrance. 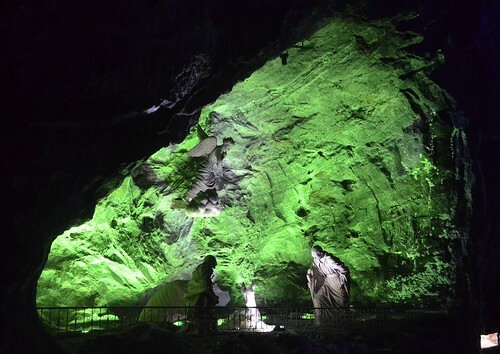 Unfortunately due to the late start, travel delays, and our extended stay in the mine, when we exited the Salt Cathedral, it was already dark outside. There were no buses or taxis to take us back into town, so we walked towards the bus station. Upon arriving we learned our fate: no more buses back to Bogota tonight. We were stranded. After a communal rotisserie “chicken” and some beers, we pooled our resources, found a hotel and some beers for the night. I had my computer, which served as our dj, and we drank our beers, chatting and listening to music. If you don’t care about your destination, you won’t have any trouble getting there.